Taste test: These are good nacho cheese tortilla chips. 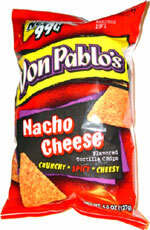 They're crisp and crunchy, and the taste is fairly cheesy. They're pretty much a clone of Doritos. Smell test: Smells like Doritos. Good. This snack was discovered by Keith and Melissa at Shell Station, Rt. 20, Auburn, Mass.. Review published .